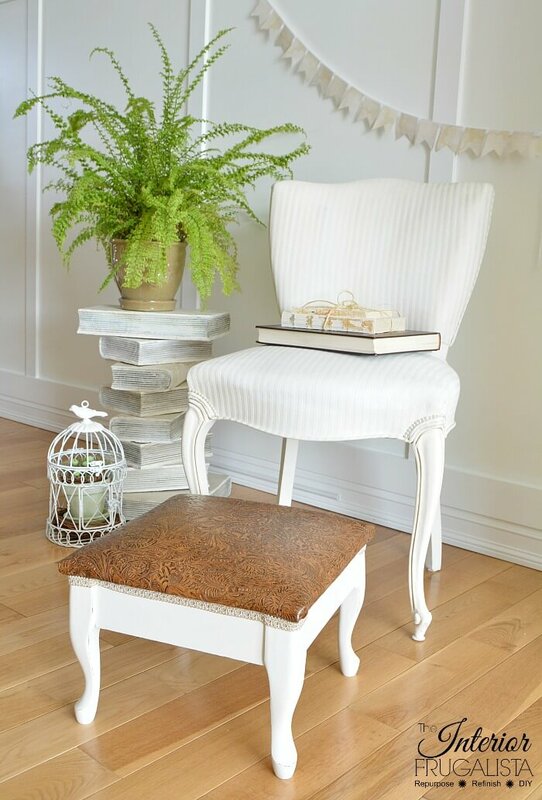 Footstools are perfect to practice chalk painting furniture and trying upholstery for the first time. They are far less intimidating than a large piece of furniture and they don't take a lot of time to finish. 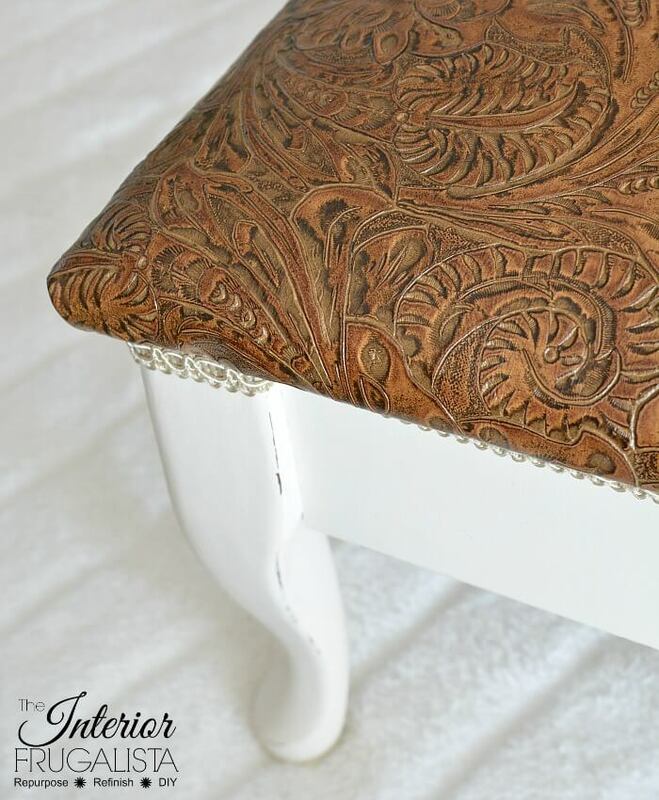 My curvy embossed leather footstool took under two hours to complete and most of that time was waiting for paint to dry. 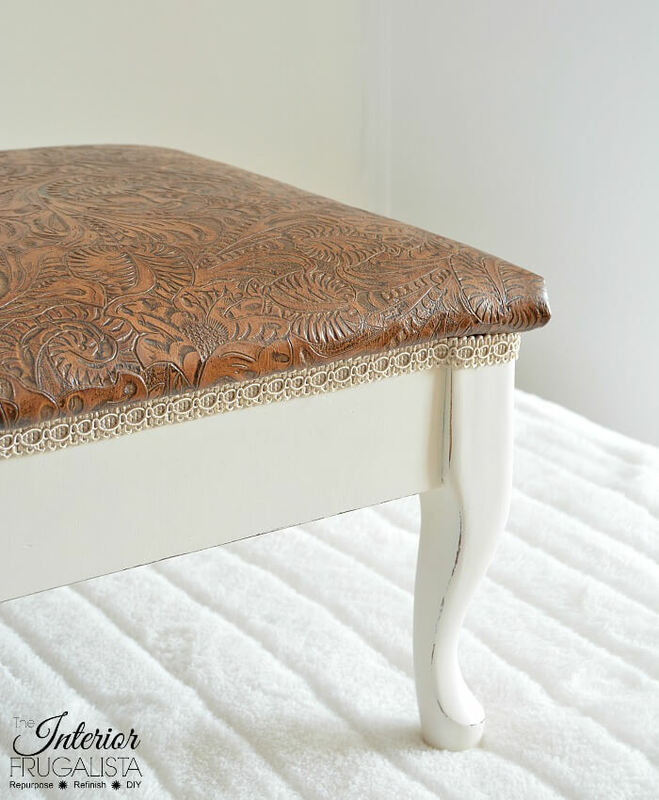 I should have titled this post the footstool that ran me dry because I used the last drop of paint in the jar, the last drop of clear coat, the last large piece of leather hide, the last strand of decorative trim, and the very last glue stick in my stash. Today I'm joining my friends in the Int'l Bloggers Club where our challenge this month is to create something with leather. I knew my small curvy thrifted footstool would be the perfect candidate to use the last piece of embossed leather hide leftover from the Art Deco Headboard Bench. 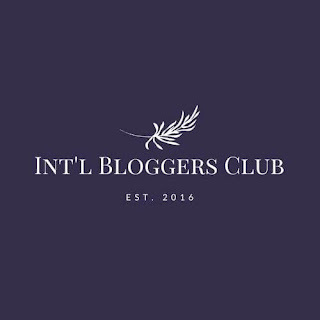 If you're new here and haven't heard of the International Bloggers Club, we are a group of friends from around the globe who come together every month to share a themed DIY project. 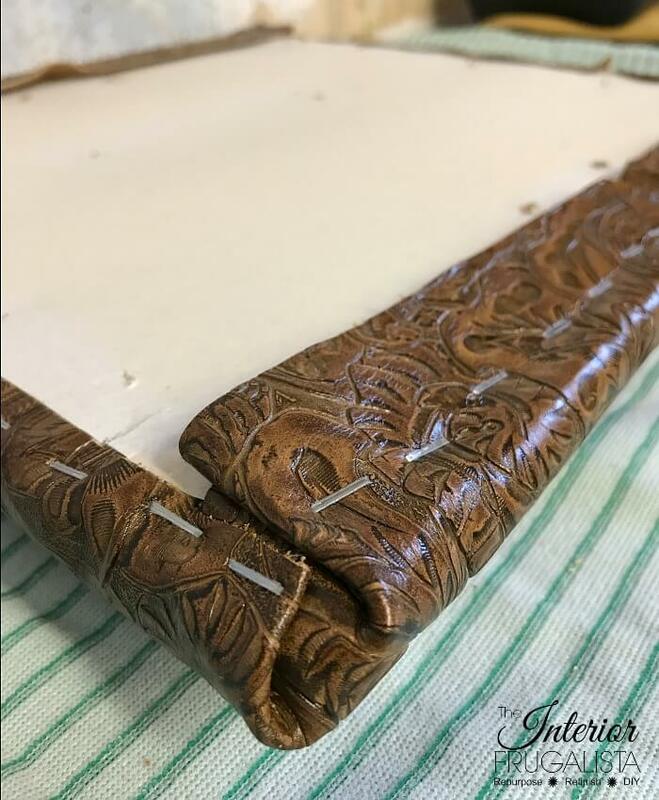 Links to my friend's leather projects are included at the bottom of this post. The last month that I participated in the challenge the theme was Valentines Day where I made a Burlap Ribbon Heart Wreath. To truly appreciate this makeover you have to see what the footstool looked like when I bought it for $8 at Goodwill. Big difference between the before and after, right? Let's take a closer look at that lovely gold crushed velvet velour that was on the top. Um yeah, that just has to go. So much prettier with this gorgeous floral embossed leather hide - look at those lovely details! 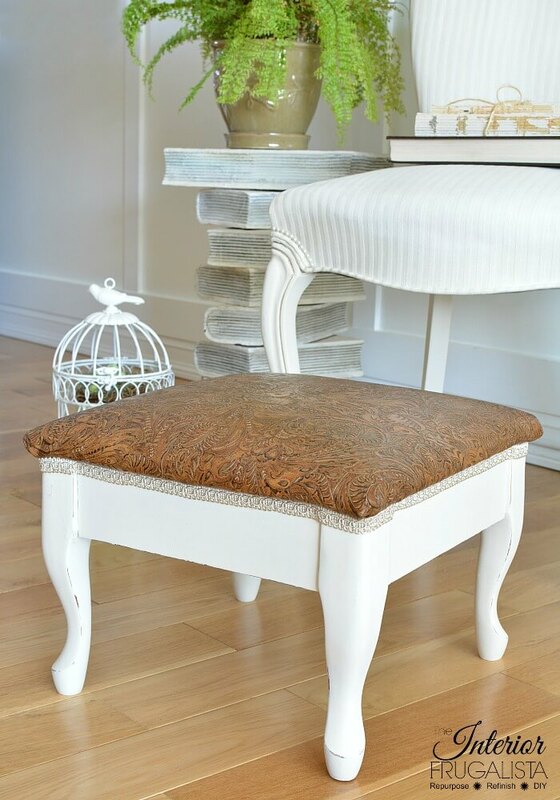 It's the perfect size footstool to pair with a small chair like the French Provincial Chair that used to be gold stripes until I painted the fabric white. Whenever I stage photos with the table in the photo above, I always get asked about it. You can find that makeover here in my White Stacked Book Table post. 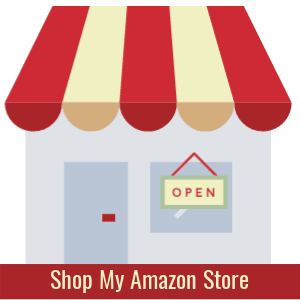 This post contains affiliate links so you can see what products I used or recommend for this makeover. See my full disclosure policy. First things first are removing the seat and prepping the wood base for paint. First I cleaned the wood with a liquid deglosser which helps with topcoat adhesion. Next, I lightly sanded the wood with 150-grit sandpaper to give the primer some bite. I probably went overboard with both the deglosser and sanding but I'd rather err on the side of caution. Because I knew the tannins in the wood would cause paint bleed, I primed the footstool with a stain blocking primer. I painted the base with two coats of Buttercream chalk paint with my favorite round paintbrush, sanding between coats with 220-grit sandpaper to a smooth finish. Once the second coat dried, I distressed along the edges of those curvy cabriole legs with sandpaper. 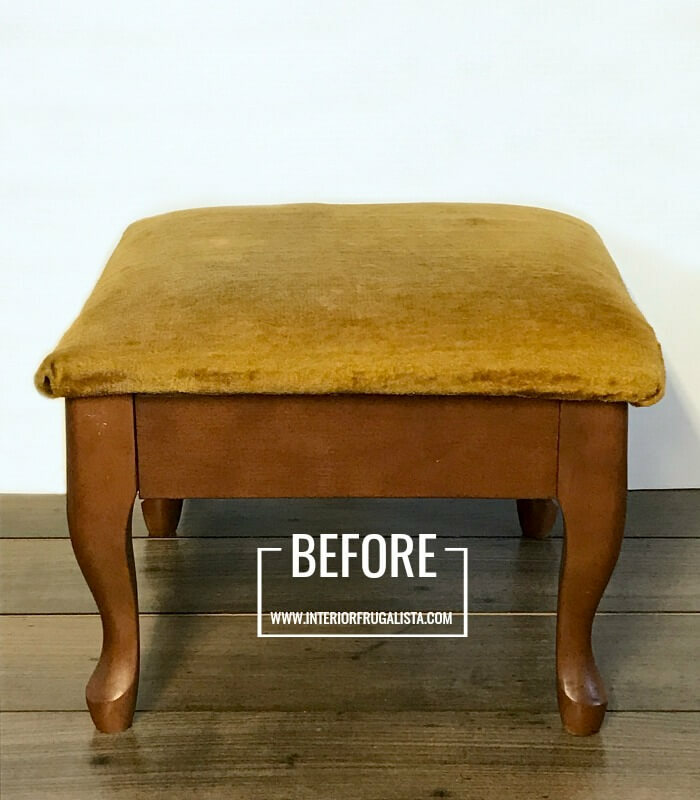 Knowing this little footstool may suffer some wear and tear, instead of my usual wax finish I applied a more durable clear coat, applied with the same round paintbrush. I love this stuff because it gives a beautiful matte finish like wax. Well, that was the easiest fabric removal I’ve ever done. 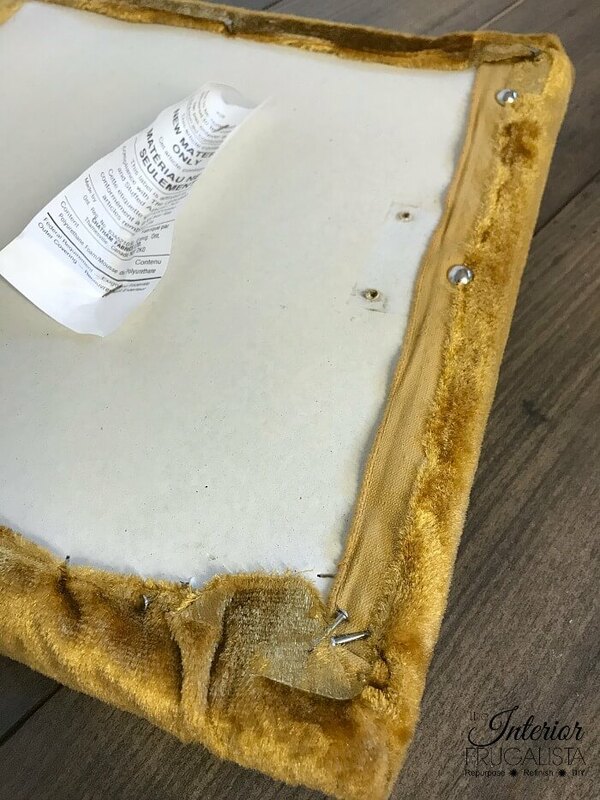 Who upholsters furniture with nails and tacks? 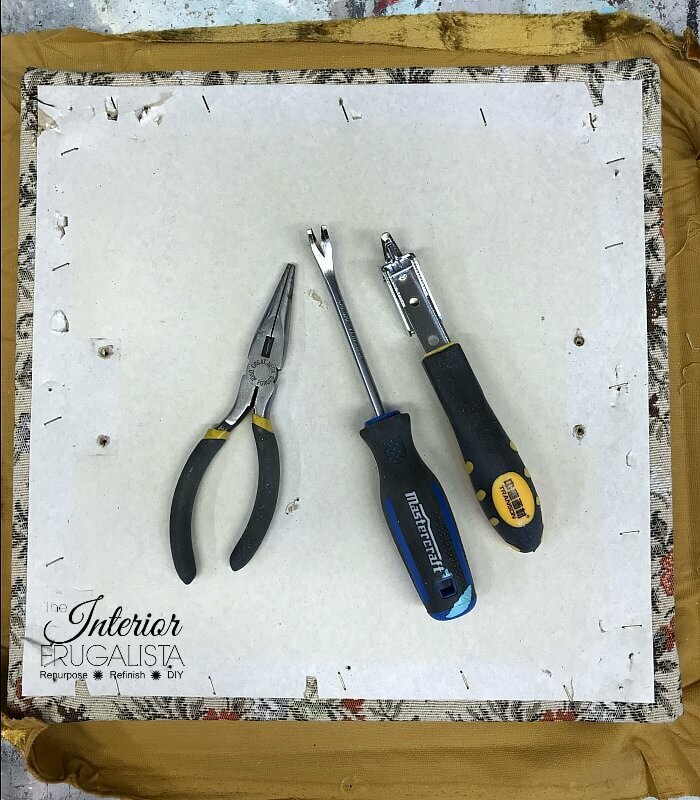 Lucky for me there wasn't a staple insight but if you're not as lucky, these inexpensive upholstery tools are a must. No more bandaids! 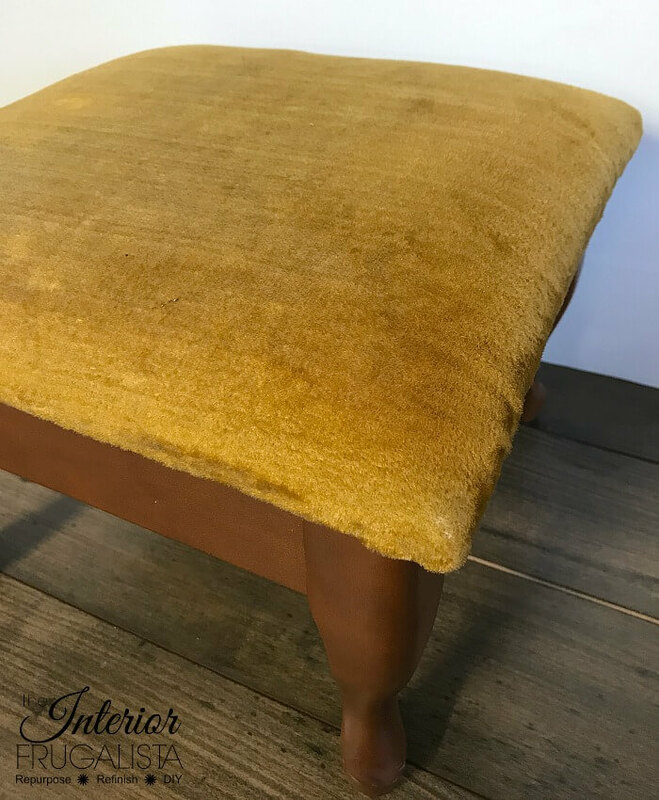 I only had one piece of embossed leather hide just barely large enough to upholster the footstool, so there was no room for error. 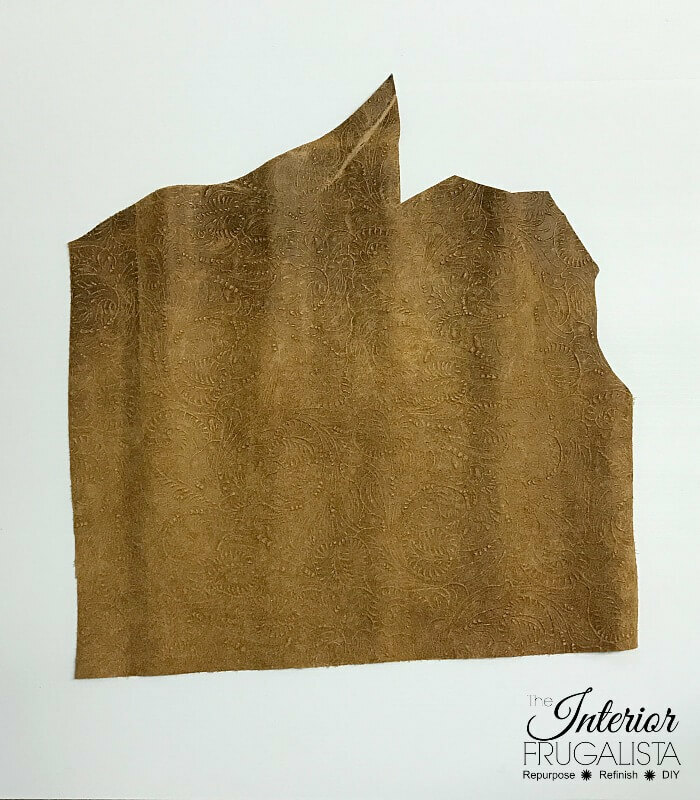 You can find the floral embossed leather hide at The Leather Hide Store. Always start in the center and work your way out, stopping about 2-3 inches from the corner. Work on the opposite side, pulling the fabric taut as you work and repeat on all four sides. 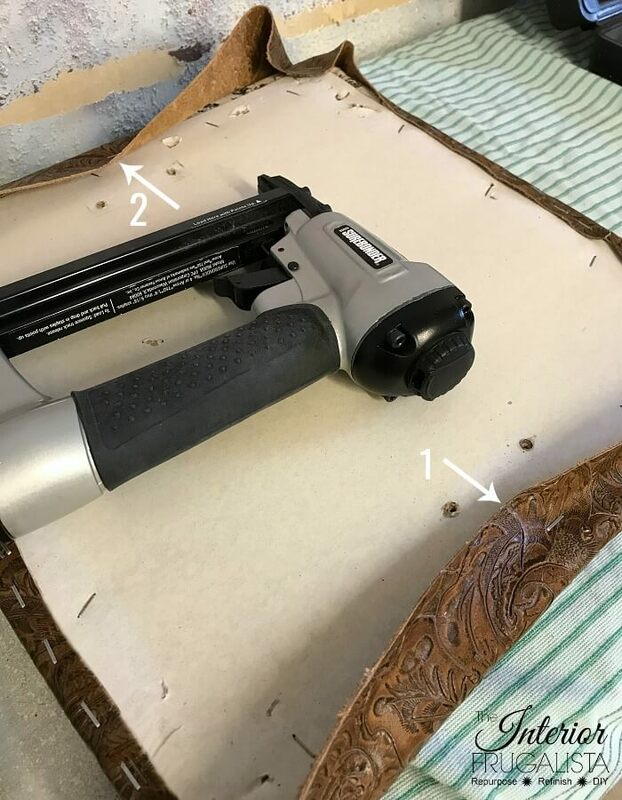 I prefer using a pneumatic staple gun because it's so much faster but an electric or handheld upholstery stapler will do the job too. Pull the fabric point on each corner into the center (as pictured below) and tack a staple to hold it flat. Fold the point on each corner up and staple in place. You can see in the photo below that there is a lot of bulk in the folds because of the thickness of the leather. I'm in no way suggesting my way of folding the corners is the proper way of doing it when working with a thicker fabric like leather. 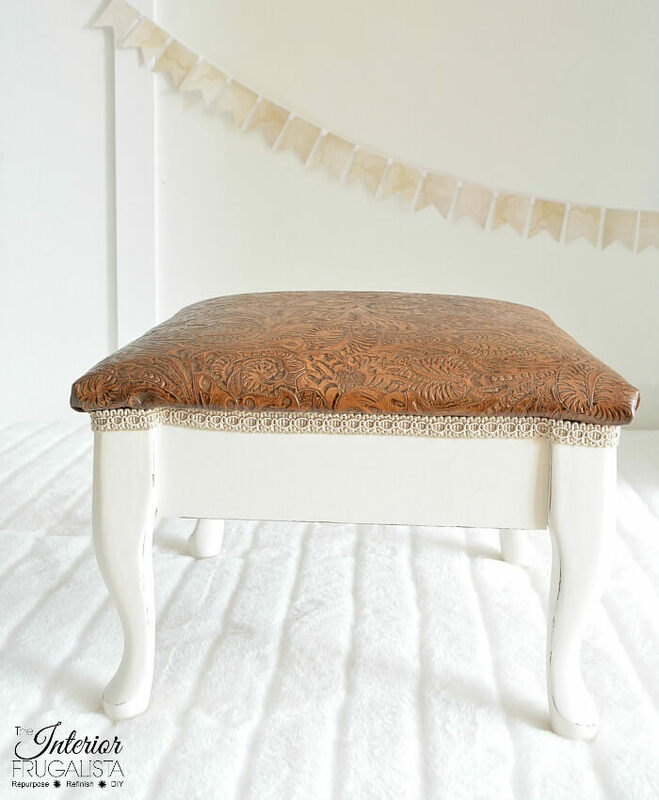 Because I don't plan on selling this footstool, I wasn't too concerned about it being perfect. If I had a larger piece of leather hide to work with, I would have sewn the corners much like I did HERE. When I reattached the seat I wasn't fond of the small gap between the base and the seat (which was there with the old fabric too). To hide it I hot glued some decorative gimp braid trim along the edge. I like how it dresses up the footstool a little bit. The upholstery, including the braid trim, took less than 30 minutes. The most time-consuming part of this makeover was waiting for product to dry. 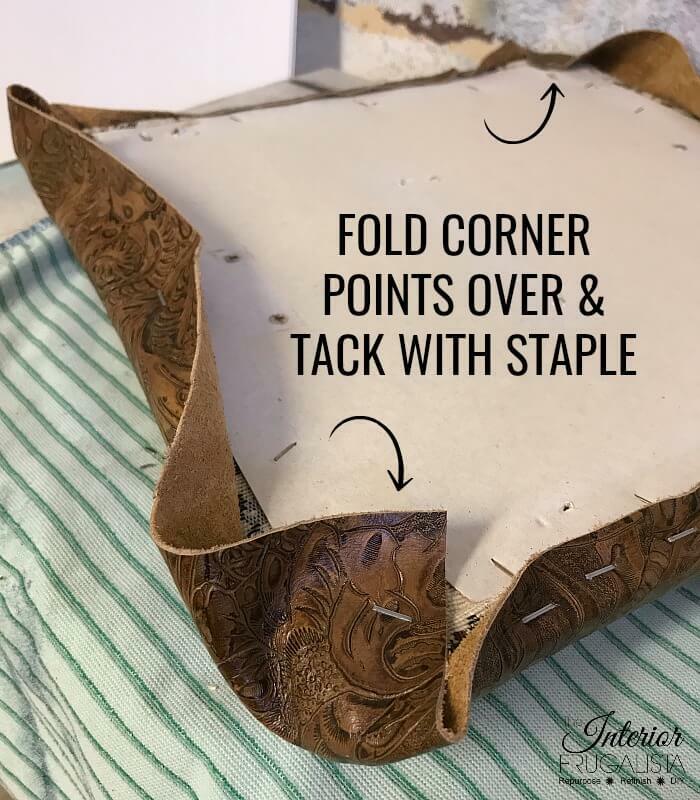 If you're new to upholstery I would not suggest you start with leather because it is much easier to fold the corners with fabric. So what do you think? 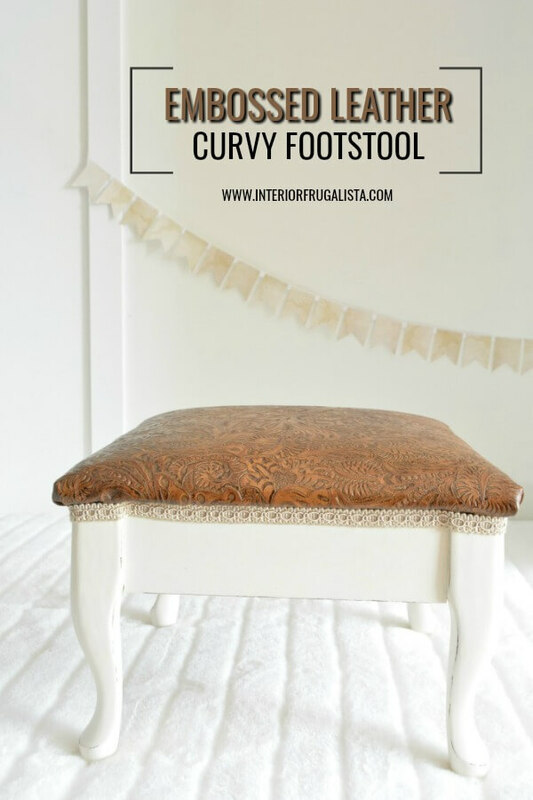 You'll be seeing this pretty little footstool in future posts as I plan on using it as a photo prop. I know right, the embossed leather is just gorgeous! I'm so happy I had a piece leftover big enough to recover this footstool. I also made a banner with it but for the life of me I can't find where I put it. Marie the difference is unbelievable. Painting it white really makes a huge difference. The leather stands out and you can really admire all that detail on the embossed leather. Great selection Marie! And of course fantastic upcycle!! Thank you so much Mary! Everything looks good painted white and you're right, it really does showcase the embossed leather. I can't wait to stage project photos with this little stool. It's gorgeous Marie, oh my what a makeover! I absolutely love the design on the leather and how well it goes with the rest of the little stool! They were meant to be! That is absolutely gorgeous Marie, it turned out amazing! I love the leather design, it goes perfectly with the rest of the little stool, they were meant to be! Thank you Katrin, I'm looking forward using this little footstool in photo props here on the blog. I love your little footstool Marie! I find that stools of almost any kind are such a quick and easy project! Thanks Tania! Yes, they're a pleasure to work on because they are so quick and easy. It's beautiful, Marie, I love the lines of the footstool. Thank you very much Sheila 🙂 I discovered this footstool is the perfect size to use with our living room wing chair so we're actually using it instead of keeping it just for photo staging. 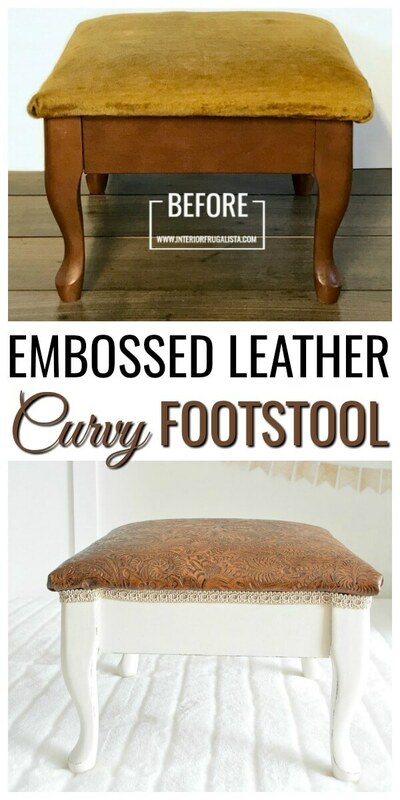 Fun DIY project---that leather look is amazing...I would be so tempted to whitewash it though...LOL. Oh gosh no, Sandi, it's not "leather look", it's the real thing! A gorgeous embossed leather hide and the brown tones work beautifully with the brown leather sofa in our living room and the white legs look great with the white painted tables in the room. 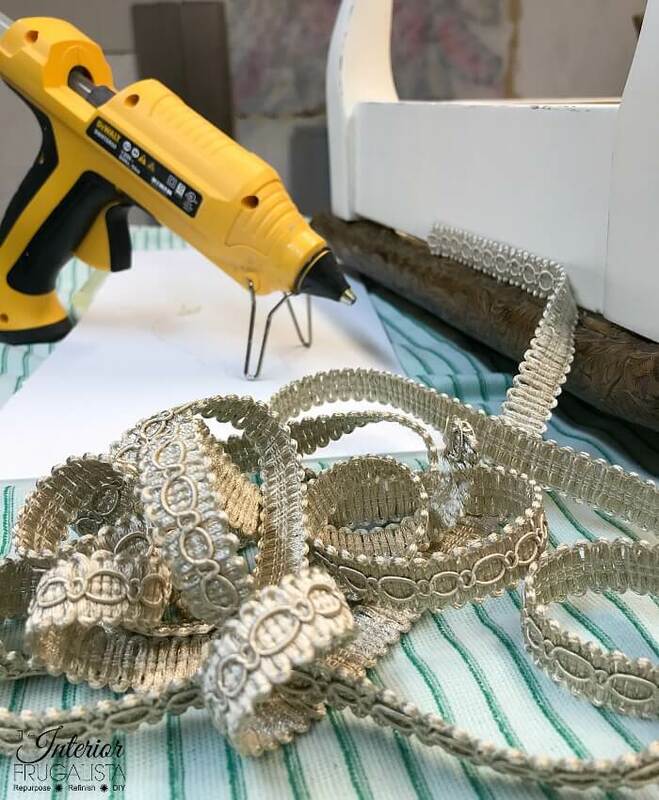 Okay---I confess I missed that---no of course you wouldn't do that to real leather...I have a piece with almost the same pattern in faux...which you have to smell to know the difference. Grins! I have missed you. Glad you are back and being creative once again. The stool came out so nice. Happy Friday. Have a great weekend. That turned out just lovely, Marie! I tell you, I never cease to be amazed at what a coat or two of white paint can do! A real cure for the uglies! And the textured leather gives it such an elegant touch. Glad you are stepping back and taking care of yourself. Here's to relaxing and enjoying life a little more. Take care. A huge improvement over the gold velour!! Love that tooled leather look. You gave it a wow transformation Marie! That trim gave it the perfect finishing touch too. This is so pretty, Marie... love that leather you used! 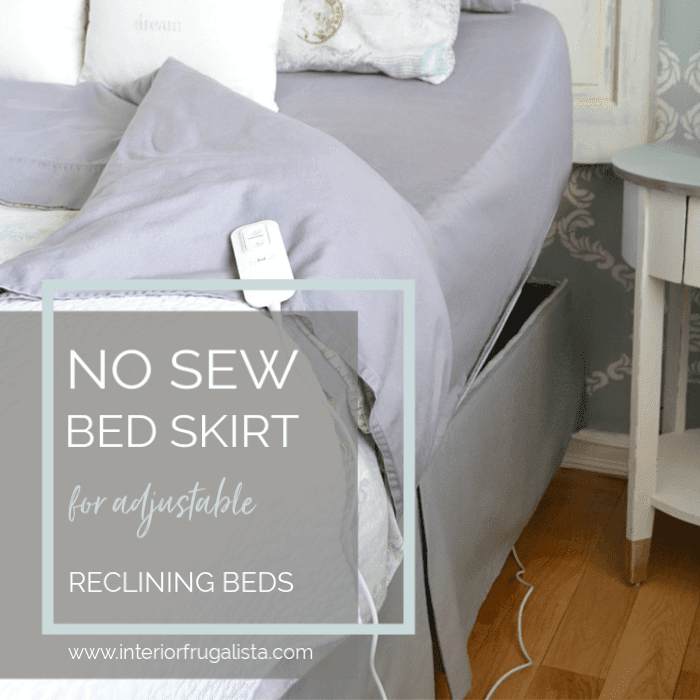 Pinned, and thanks for sharing at Homestyle Gathering! Thank you Julie 😊 I know, right! The embossed leather hide is so beautiful. I have enough leftover to use on another smaller project. This looks so good with the white chair. I never ever would have considered pairing leather with french provincial. Such a gorgeous contrast. You taught me something yet again. I never would consider upholstering a larger piece of french provincial furniture like a chair with leather but a footstool, meh, why not 😉 The intention was to use the stool as a photo prop but it's so comfortable with our large wing chair that it's now being used daily! 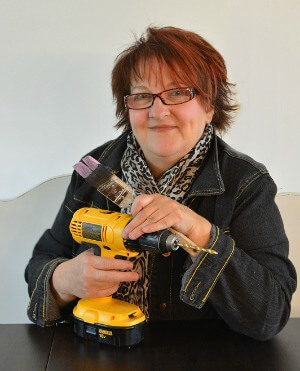 Just letting you know you are one of my features this week at Homestyle Gathering! I love the leather top you added this stool! It turned out so pretty! Thanks for joining us and sharing over at HG!